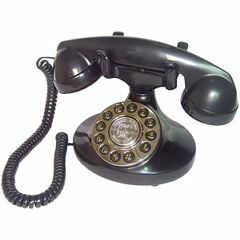 Paramount Collections Alexis decorator phone features plastic construction with push button dialing in a rotary fashion plate. Also features last number redial, handset volume control(low/high) and ringer volume control(low/high). handset does not sit firm. need to adjust . The item is very nice and replaced a bigger reproduction I had on my night table. However, the handset needs to be adjusted to sit firmly in place so the phone is not off the hook - once situated it stays in place. So overall, nice product. And this website had the best price.